Having Trouble Picking a Fishing Line This Year? Me Too! It’s that time of year when days are short, water is cold and most of us start preparing for the upcoming season: going over tackle, cleaning reels, and respooling line and on the topic of line - a quick glance at a major tackle retailer’s website shows 31 different brands of line and most brands make more than one type of line whether it’s fluorocarbon, copolymer, monofilament, braid, or some hybrid. 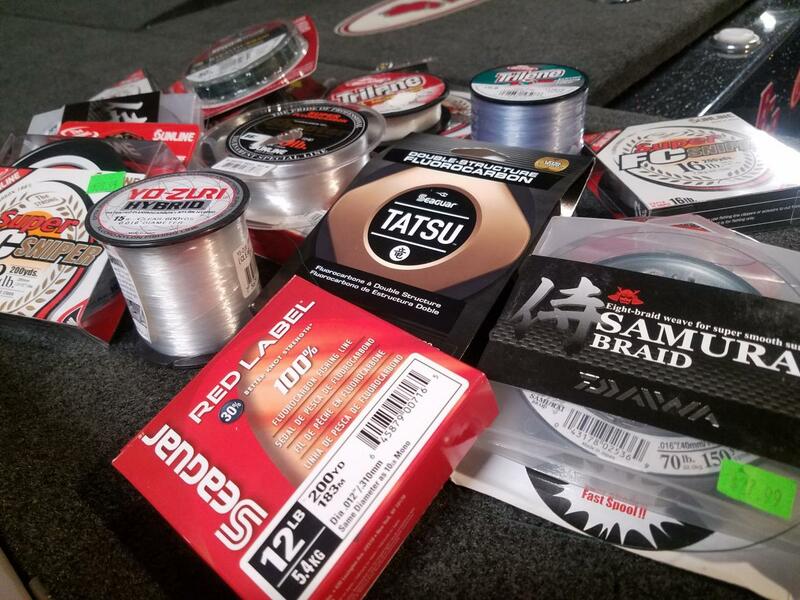 With so many choices available how do you choose what to trust on your spool? I mean after all; people choose who they’re going to marry off the internet so picking something as simple as fishing line should be easy with all the information available, certainly using the googler will provide some clarity right? Wrong. Compelled by several crippling breakoffs on key fish one season several years ago, I took to the internet to find the ultimate fishing line that was impervious to rocks, zebra mussels, dock cables, angry small mouths, and poorly tied knots. Based on my research and personal experience I’d like to summarize what I found so that I may save Anglerhub readers some time and money. I don’t remember my first fishing trip or the first fish I caught or my first fishing pole, most likely the reason for this is I hadn’t reached the age of one yet when all these events took place. My Dad had me out on Lake Tenkiller chasing largemouths before I could walk, that’s just how we rolled in Blackgum, Oklahoma. One detail I do remember from my earliest days on the water with Dad – the distinctive white and purple packaging and the blue fluorescent line inside it. Back then choosing a fishing line was much easier. I don’t know why Dad chose Stren but if I was guessing I’d say that it was probably a few cents cheaper than its only major competitor: Trilene. Fast forward to today – the selection of fishing line available is enough to make your head explode. Line tends to go in popularity cycles, when braided line first hit the mainstream market almost every rod on the lake had Spiderwire on it, I distinctly remember talk at tournament weigh ins of the incredible sensitivity and also curses of previously unimaginable backlashes. Not long after, some of the same guys that had touted braid as the greatest contrivance to ever hit fishing were back to monofilament. Fluorocarbon was the next trend followed by the hybrid line trend and now the premium fluorocarbon trend. I believe all these lines have a place on your reels. Being the competitive bass fisherman I am, I have followed all these trends to try to gain an advantage over the other competitors and have gained a vast amount of knowledge through trial and error. An article detailing all lines and the best situations for those lines would be extremely lengthy so here are a few pointers I’ve learned the hard way. -There is absolutely nothing wrong with using monofilament. It will never be as sensitive as braid or fluorocarbon; you will never feel the subtlest bites as well on mono but it straight works, it’s manageable and easy to use and also reasonably priced. Ask a Falcon Lake Texas guide who specialized in deep cranking and he’ll tell you to bring your cranking sticks spooled with Trilene Big Game. That’s enough of an endorsement for me, they routinely pull double digit bass out of the submerged jungles of South Texas that Falcon is famous for. I use Big Game with great success on my cranking setups, it is cheap enough that I respool it after every trip. Don’t respool often and it will give you problems from memory, it floats, and it stretches like a bungee cord so it’s not going to be ideal for bottom contact presentations where feel is important. The buoyancy makes it an excellent choice to use for top water presentations as well. -Braid is awesome. Sometimes... You can’t beat the sensitivity of braid, however, braid is hard on rods with softer guides, it digs in to wood cover, and it’s debatable that you get fewer bites in clear water due to its color. I lose less tackle with braid because I can usually pull free any hang-ups I have, however, braided line is more expensive than mono and it has the bad habit of wind looping around your rod tip when you’re not paying attention and backlashes or overruns in your reel can leave you picking and cutting at your spool wasting valuable fishing time. With that said, I use braid more than ever now and I’ll go in to why later. - Fluorocarbon is not always the best choice. When fluorocarbon became popular I bought the hype and ran out and spooled all my reels with it. Soon after I was on a fantastic flipping bite where the fish were in shallow, heavy cover and my presentations were at close range, sometimes with less than 6 or 8 feet of line out. Being accustomed to the stretch and shock absorbing properties of monofilament I naturally set the hook like I was swinging for the fences at Fenway Park. That day I learned that not all fluorocarbon lines have good shock absorbing characteristics, the line would shatter on the hookset or would break at the knot. Lesson learned. Fluorocarbons have come a long way since then and each one seems to be different. I’ve pretty much tried them all and can’t say I’ve found a perfect one yet, the lines I like best tend to be in the premium category that comes along with a premium price. It’s hard to generalize fluorocarbon lines as there are so many different ones on the market, a good starting point are the reviews of the individual products on retailer’s websites, however, I have found that while mostly I agree with the ratings, some can be misleading. Someone who has never used fluoro may not know that not all knots work well or that a loop in the spool can create a weak spot that may break during a cast and send your fifteen-dollar crankbait into orbit. I don’t believe there is one perfect line for every situation, for instance, I like a good stretchy mono for most crankbaits with the exception of squarebills and lipless cranks that I throw in some nasty cover, for those I use a heavier line like 15lb Yo-Zuri Hybrid and for crankbaits that I am trying to reach the maximum depth I like fluorocarbon because it sinks and helps cranks dive deeper, also suspending jerkbaits tend to work better when thrown on fluoro. For bottom contact baits like jigs, sensitivity is important, in years past I found that premium fluoro like Sunline Shooter or Seaguar Tatsu had sensitivity and abrasion resistance that I liked but the high cost kept me looking for a more reasonably priced alternative. A while back while watching a fishing show Aaron Martens was talking about his spinning rod setup, he used braided main line with a 6-foot fluorocarbon leader, well known for his prowess with a spinning rod I took his advice and went to a 10lb braided main line with an 8lb fluoro leader tied with a Crazy Alberto knot - https://youtu.be/aXjagwdjAhg . The increased sensitivity and strength of this setup combined with the superior handling of braid on spinning reels was revolutionary, then, a major breakthrough for me was during a midwinter reel cleaning and respooling session – I went to pull the year-old braid from a well-used spinning setup and realized the braided line was still as good as new so there was no reason to change it. Looking at the 18 other setups I had yet to respool, a dim lightbulb in my head – what if I used braid-to-fluoro setup on all my bottom contact rods? The cost savings from not respooling as often would be profound. I spooled my favorite jig rod with 50lb Daiwa Samurai Braid and using the Alberto knot, tied an 8-foot Sunline Shooter leader and after using it in a variety of situations had such success that I changed most of my rods to this setup. My feeling is that this setup has all the best characteristics and less expensive due to the longevity of the braid. I retie a new leader each trip to the lake, therefore, one spool of premium fluorocarbon will last an entire year. Since switching to the braid-to-fluoro combination I save about 50% per year on line and believe I put more fish in the boat. Try it! Hope my thoughts and experience helps some younger anglers and maybe some others who have yet to try premium lines due to their high cost with this method you can save a ton of money and still enjoy the benefits of modern fluorocarbons and braided lines.